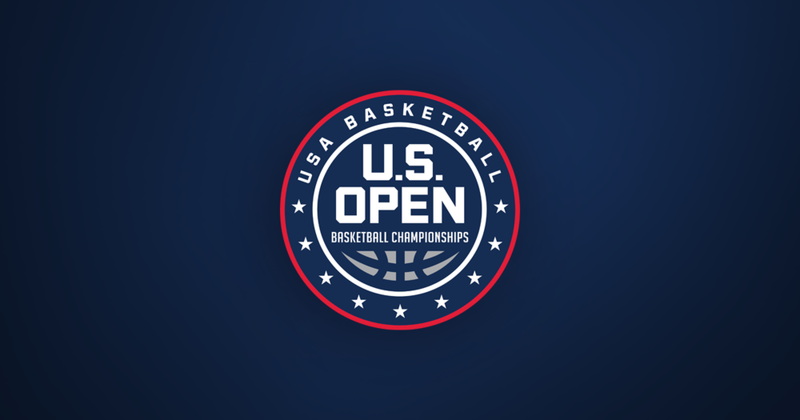 USA Basketball Announces U.S. Open Basketball Championships — Position Sports, Inc. Offered through USA Basketball’s Youth Development division, the U.S. Open Basketball Championships is an inclusive tournament structure in which existing basketball tournaments meeting USA Basketball approved youth development standards will serve as qualifying events for the 2018 U.S. Open Basketball Championships. The qualifying process will require teams to compete in one of the USA Basketball certified tournaments throughout the United States. Leading up to the U.S. Open Basketball Championships, it is expected that approximately 3,000 teams, 36,000 players and 6,000 coaches will take part in the selected qualifying tournaments across the country. In addition to following established development standards, the U.S. Open Basketball Championships will require all coaches to possess a valid USA Basketball Coach License. The top two finishing teams from each group and division of a qualifying tournament will earn a bid to enter the U.S. Open Basketball Championships. For information on player eligibility or to register a team for pre-approved qualifying events, visit www.usab.com/usopenbasketball. The 2018 U.S. Open Basketball Championships will consist of six groups of play: eighth grade boys, eighth grade girls, 13 and under boys, 13 and under girls, 12 and under boys and 12 and under girls. Additionally, each age or grade category will offer two divisions to provide for varying levels of competition and ability. The Stars division will be offered for established and competitive club teams that regularly compete regionally and/or nationally. The Stripes division is offered for newer and/or locally based recreational teams seeking compatible competition. The 2018 U.S. Open Basketball Championships for qualified boys teams will be held June 30-July 3, and the girls championships will take place July 19-22. Both the boys and girls championships will be hosted at the Pacers Athletic Center at Grand Park located in Westfield, Indiana. USA Basketball is accepting applications from event operators interested in hosting a 2018 U.S. Open Basketball Championships qualifying tournament at: www.usab.com/hostofficialqualifier. The U.S. Open Basketball Championships will incorporate youth basketball guidelines established by joint working groups developed by USA Basketball and the NBA, which can be found at www.youthguidelines.com. In 2016, USA Basketball and the NBA partnered to establish three expert working groups focused on health and wellness, playing standards, and curriculum. The joint working groups developed the first-ever youth basketball guidelines aimed at improving the way children, parents and coaches experience the game, with a specific emphasis on promoting player health and wellness. Nike is an official partner of USA Basketball’s Youth Development division, which is tasked with developing youth basketball initiatives that promote, grow and elevate the game. Based in Colorado Springs, Colorado, USA Basketball is a nonprofit organization and the national governing body for basketball in the United States. As the recognized governing body for basketball in the U.S. by the International Basketball Federation (FIBA) and the United States Olympic Committee (USOC), USA Basketball is responsible for the selection, training and fielding of USA national teams that compete in FIBA-sponsored international competitions, as well as for some national competitions, and for the development of youth basketball. The USA Basketball Youth Development division is tasked with the development of youth basketball initiatives that address player development, coach education and safety, while promoting, growing, and elevating the game. USA Basketball is committed to providing youth throughout the country safe, fun and developmentally-appropriate environments in which they can enjoy the game. Current USA Basketball Youth initiatives include coach licensing and education; organization accreditation; coach academies; regional skill camps; youth clinics; open court programs; and the U.S. Open Basketball Championships.